This is book 2 of what I have decided is my least favorite Meg Cabot series. Luckily, I did enjoy this one more than the first. 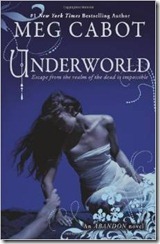 Like the title says, Underworld starts in the underworld where John has whisked Pierce away to protect her from her fury possessed grandmother. Pretty early in the book Pierce learns of her destiny, something that took me by surprise (in a good way). In fact, I may never eat waffles again. She then learns of some disturbing news of what is happening on Isla Huesos and convinces John to take her back. One of the things I liked about this book is the development of Pierce’s character. While I still found her a tad annoying, I began to see hits on the strong spunky heroine we expect from Meg Cabot. We also meet some fun new characters and begin to see the development of the support network I missed in the last book. It did occur to me while reading this book that this series would translate well to film. So while I’m not too excited about the book, I would love to see the movie or TV versions.